After many years of discussion of the suitability of trams in Exeter's narrow streets, the enabling legislation, the Exeter Tramway Bill, was placed before the House of Common in May 1881. A new company the Exeter Tramways Company Limited, had been formed and met with local shareholders on 15th November 1881 to agree plans to provide a service for Exeter's 50.450 inhabitants. On the 6th April 1882, the first route was opened between Paris Street and the Diocesan Training college in Heavitree Road. Following the purchase of the Exeter Tramways Company, the way was then clear for the Council to develop detailed plans for introduction of electric trams. Reporting at the Council meeting on 30th April 1904, the City Surveyor and Electrical Engineers submitted, to the Tramways Committe, plans and specifications for the construction of the two routes from Dunsford Gate to Pinhoe Road and from St David's Station to Livery Dole totalling about four miles of router length with passing places and for twelve double-deck tram cars. Over the next few months much work was undertaken in preparation for the start of the new electric tram service with the delivered of new trams rails and building of a new depot. Christmas Eve 1904 records the last rivet "thoroughly sound and well and truly driven" on the new Exe Bridge in the presence of Civic leaders and contractors' representatives. Over the next three months the pace of construction continued and the important junction of Queen Street and High Street was started on 6th January 1905. Following this, some construction workers downed tools for more money and, when none was forthcoming, they filled in the trenches again. Work did, however, resume next day. On the 28th January 1905 the Electrical Engineer reported that the Westinghouse-Bellis tramway generator has been completed and had been run on preliminary trails up to full load with satisfactory results. The first electric tramcar trial run was made on the 24th March 1905. It was brilliantly lit inside and out and had the word 'Special' in illuminated letters at each end. Fitting and pomp and circumstance marked the initiation of the new service on Tuesday 4th April, the sections therby dedicated to the use of the public being GUILDHALL to PINHOE ROAD an LIVERY ROAD to ST. DAVID'S STATION. The start had been fixed for 12.30 and, at exactly 12.30, five cars rolled down the High Street to the Guildhall between several thousand cheering citizens. At 12.31 the Mayor took his place on the platform to drive the tram and at 12.32 the car commenced its journey. In front, was one of the old horse trams, which lead the way as fare as Paris Street, where it drew ahead to St Sidwell's to let the electric cars go down Paris Street to Livery Dole. WHOTT celebrated the Centenary of Exeter's Electric Trams by holding a three-day exhibiton in Exeter's Guildhall shopping centre from the 4th-6th April 2005. 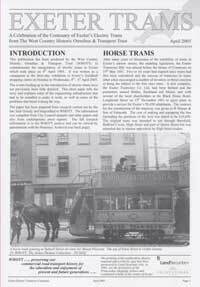 Further information on the history of Exeter trams can be found in WHOTT centenary booklet, details below.